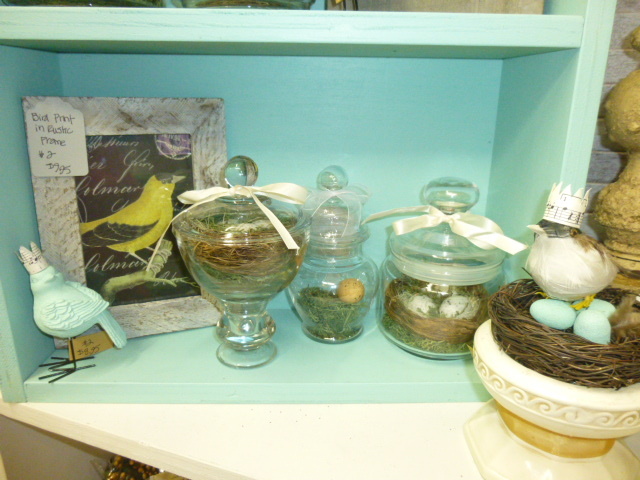 Pulled the left over Valentine stuff and put in a good amount of spring. 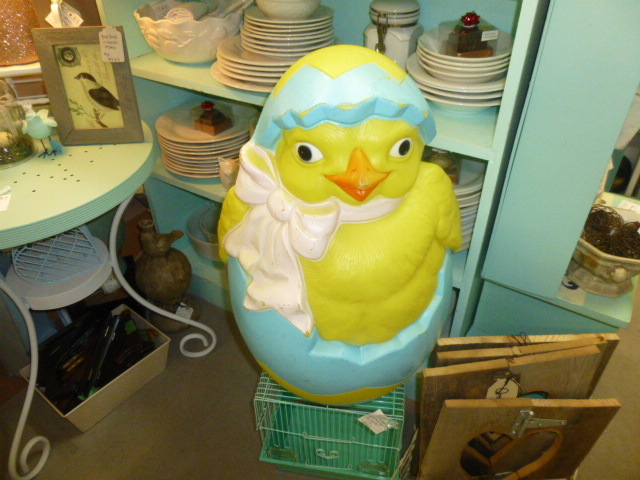 A BIG vintage Easter chick blow mold. 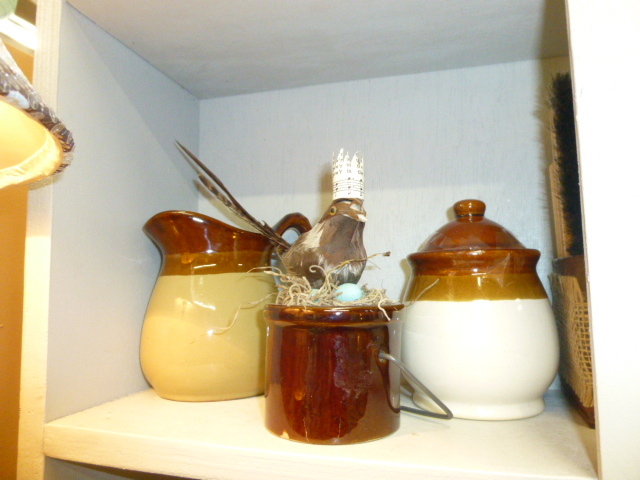 Paint is a bit faded and worn away in some spots, and it is missing the light fixture, so I’ve priced it considerably lower than what they would go for in perfect condition. 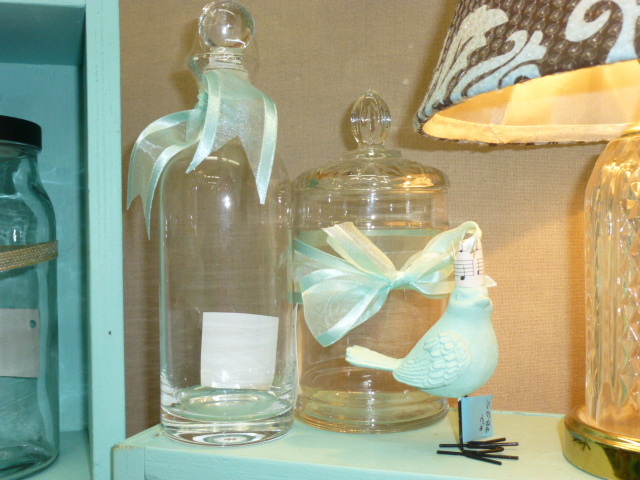 Another booth had some just like this, with the light in tact and they were $49.95. Mine is $21.95. 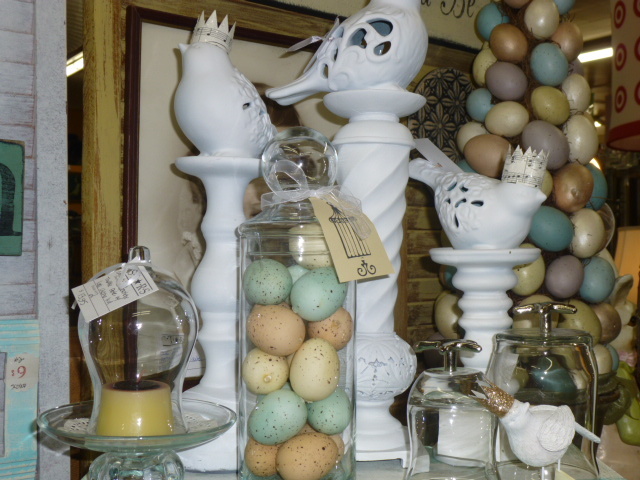 Fun bit of nostalgia for your Easter decorating. 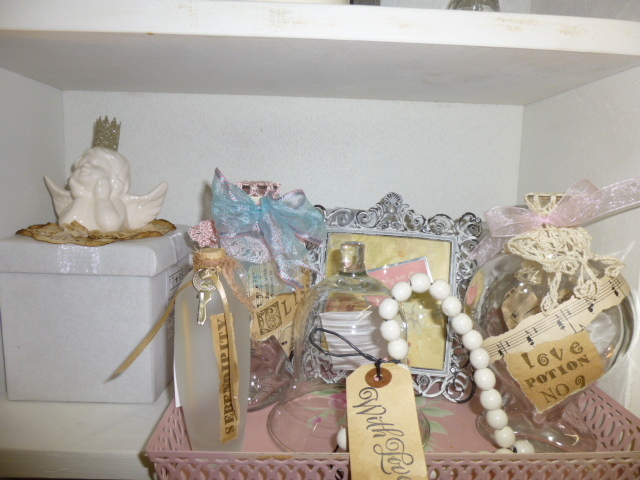 Lots of Easter decorations on top od the dresser. 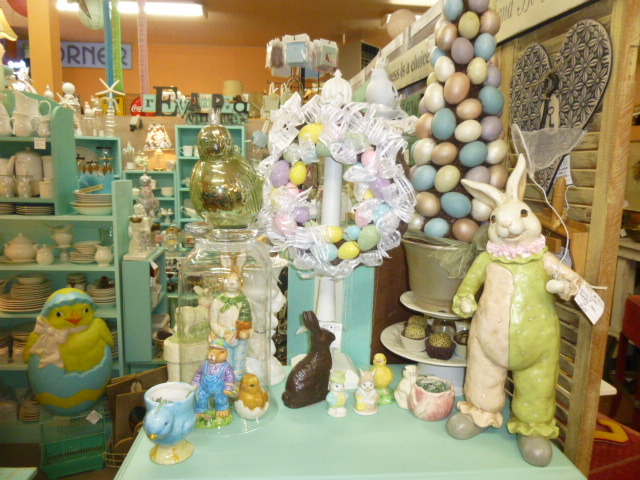 A big Easter egg topiary tree, a glittery Easter egg wreath (shown hanging from a table top wreath stand, sold separately) . 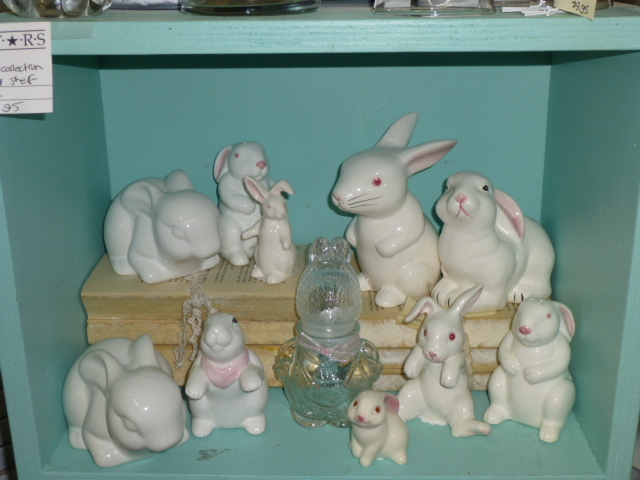 The big bunny on the far right is holding a butterfly net. 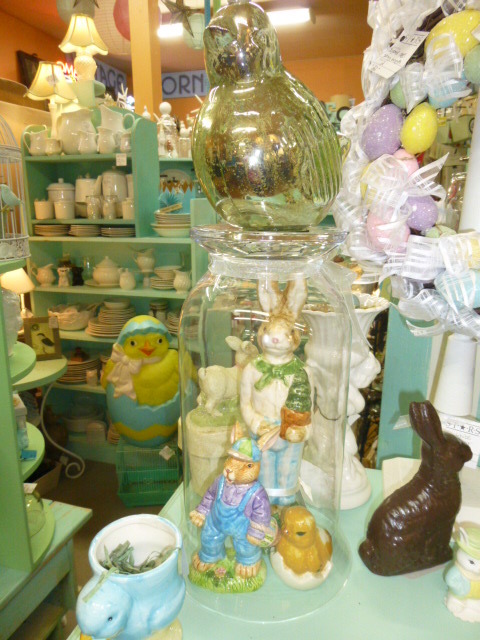 Lots of Easter smalls too, including a faux chocolate bunny! I was going to take the buttery fly net off and have him hold an Easter basket, but I just ran out of time! 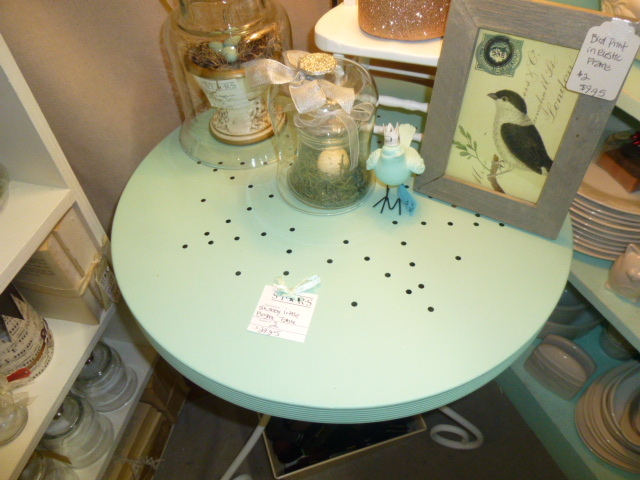 New punched metal accent table. 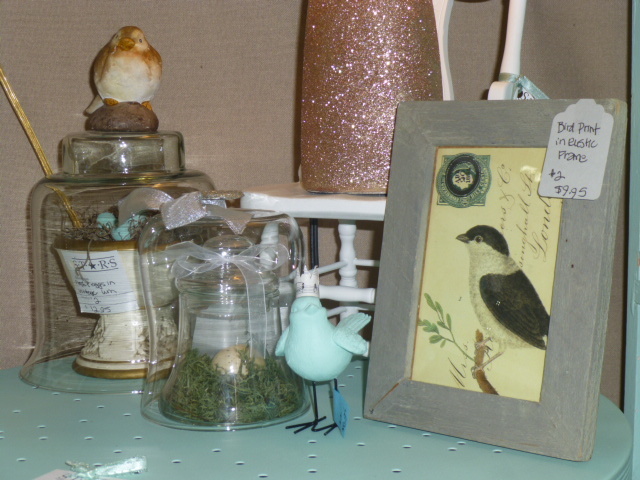 Lots of vintage style framed bird post cards, nests and jars filled with moss and eggs. 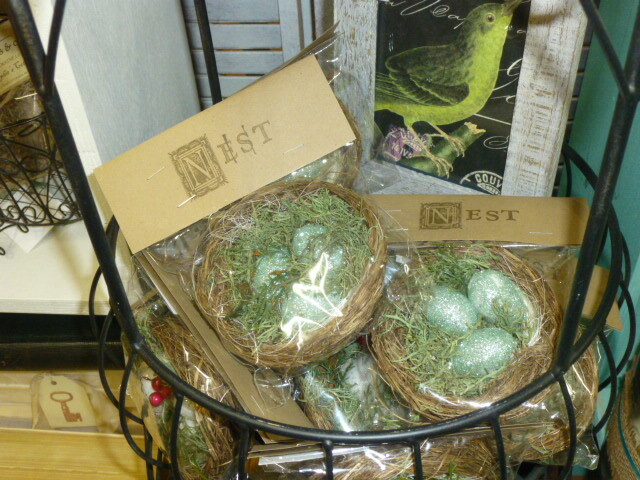 Little bagged nests with aqua glittered eggs, if you already have a jar or pedestal to put them on. 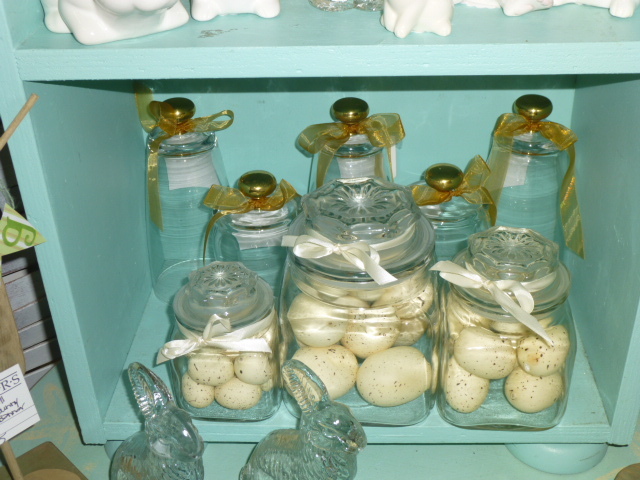 Apothecary jars of speckled eggs. Jar of layered colored eggs. Bunnies!! 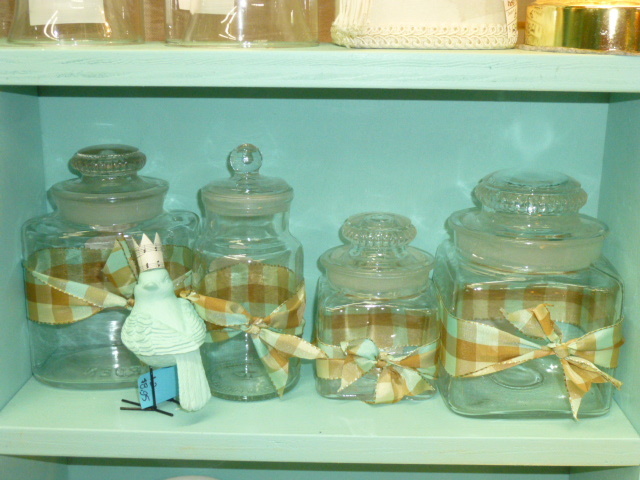 Many of the smaller ones are salt shakers! One is a bank. 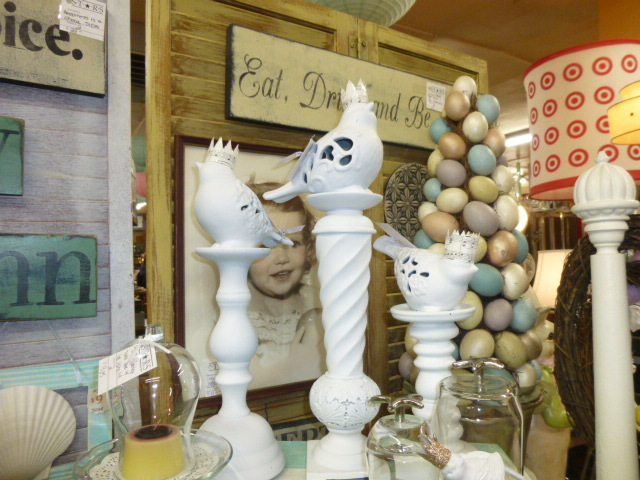 The rest are just decorative. 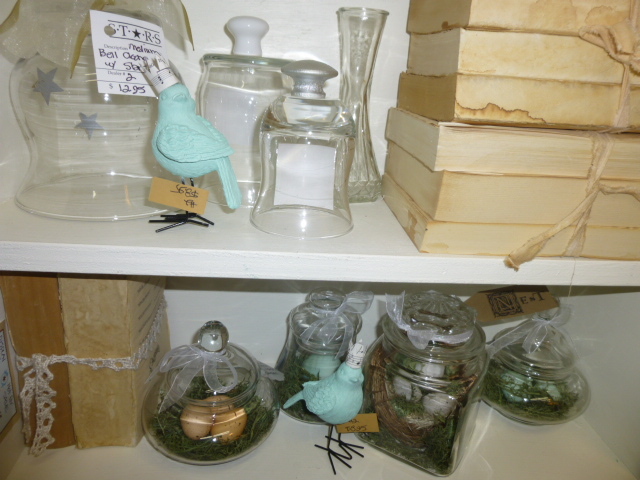 A new batch of aqua birds with vintage sheet music crowns. 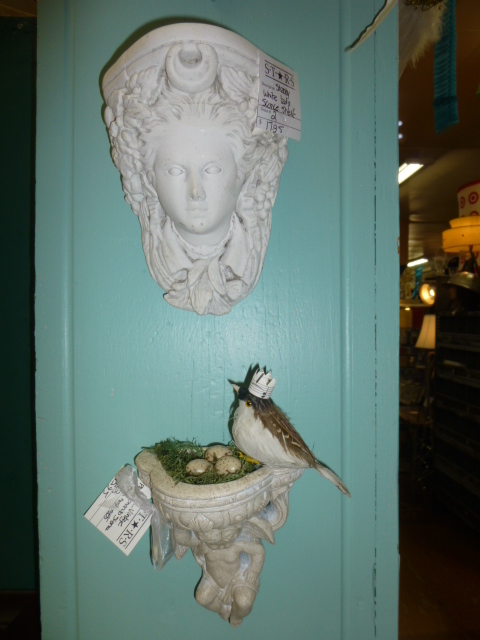 Moss nest and eggs in a vintage cherub wall sconce with feather bird. 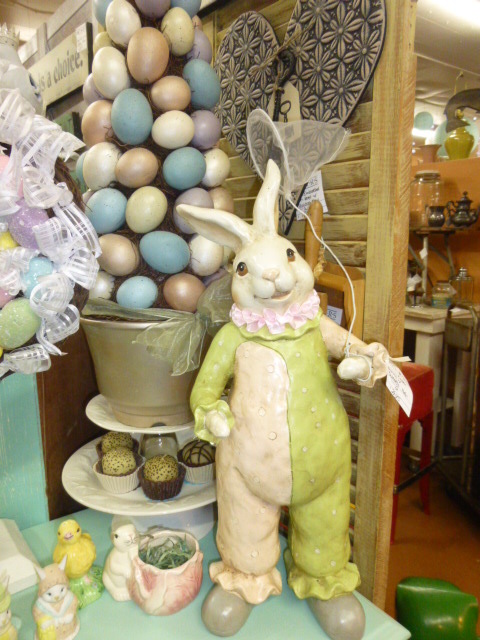 How much is bunny with net and the Easter egg tree? I have no way of knowing if they are still there or not. 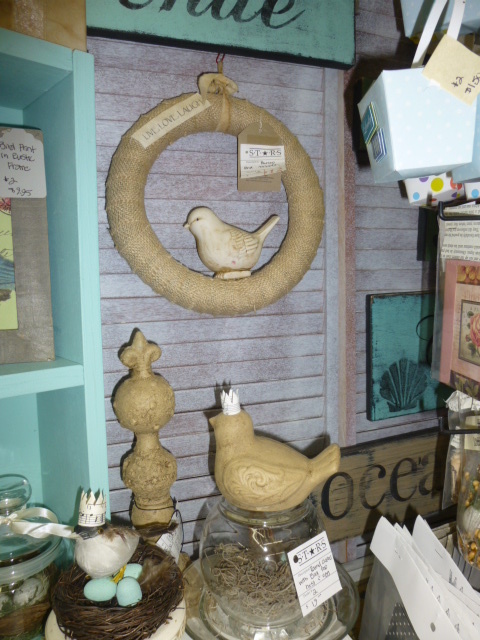 And since they are in my booth at the antique mall, I cannot place any kind of hold on them. 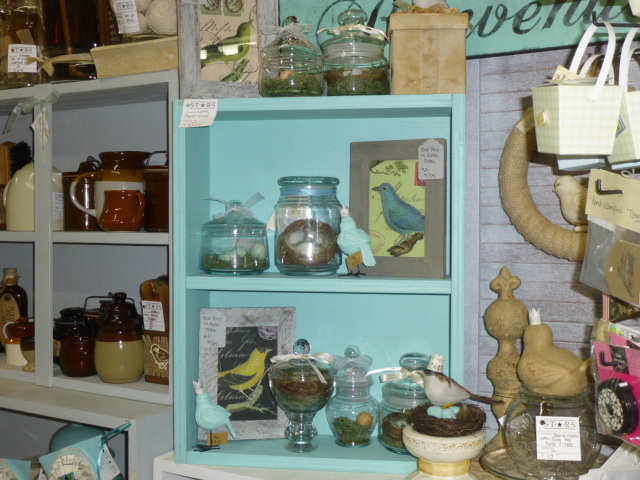 Wow, the shop looks great! 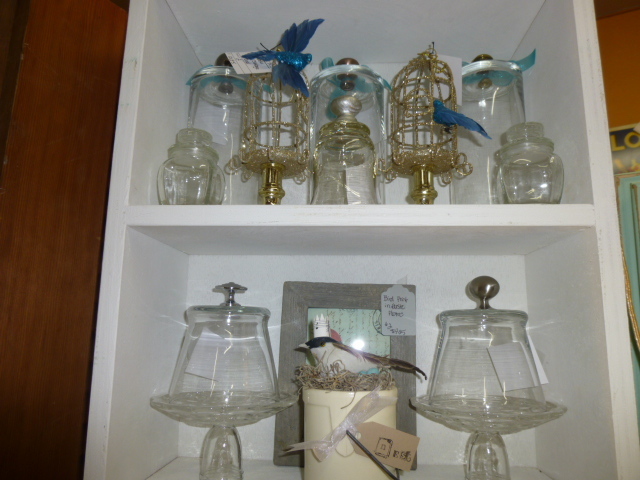 You have a really big space- is it difficult to keep it stocked? It’s really only and 8’x10′ space, so not really all that big. I WISH I had a bigger space so I’d have room for more furniture. I have no problem keeping it full! 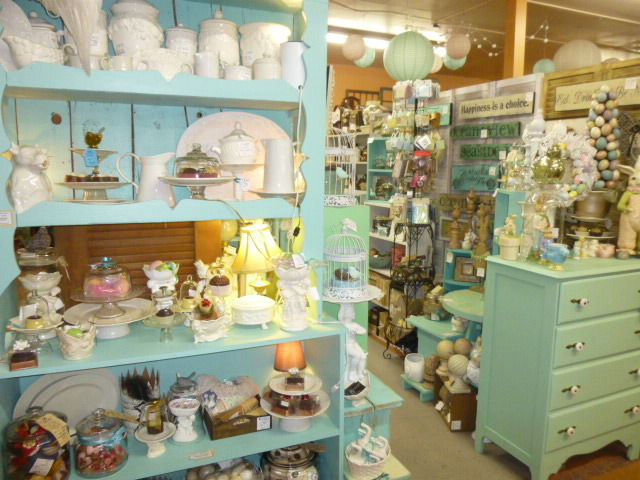 LOVE shoping and hunting for vintage finds! I never would have guessed that your space is 8×10! It seems a lot bigger. You maximize the space for sure!